My love affair with Lily-of-the-Valley began in earnest when I started dating Brad. As I would pull into the driveway of his parent’s home in Grand Rapids, clumps of Lily-of-the-Valley lined the side of the house, releasing their fragrant scent and beckoned me to stick my nose into those tiny, cup-shaped flowers. I could never seem to get enough of the smell. For awhile, I indulged myself by purchasing Crabtree and Evelyn’s Lily-of-the-Valley soap because it smelled so much like the real flower. Once Brad and I married, I waited for the day when we would own our own place so I could plant as much Lily-of-the-Valley as I wanted. I waited almost eight years and received my first plants in the most unexpected way. Brad was a computer consultant at the time and he often found himself in the car driving to clients at random times during the day. He listened to WGN radio when he was in the car and on this particular day found himself listening to the “Kathy and Judy” show. The girlfriends liked to garden and were discussing Lily-of-the-Valley. One of the girlfriends had thinned her Lily-of-the-Valley and was offering it to listeners if they called in and gave their address. (One of the downsides of this plant is that it can be invasive—really?). To be honest, lying in a field of Lily-of-the-Valley doesn’t sound all that bad to me. Anyways, only a true gardener would take the trouble to send plants throughout the Chicago area to random listeners instead of just throwing them out! My sweet husband called in and requested some plants and a few days later a box arrived with a clump of plants, waiting to be put into the earth. I only had green leaves the first year, and the second year a few more plants appeared come springtime. Just as my Lily-of-the-Valley started to take off, we moved to Vancouver to begin our graduate school adventures. 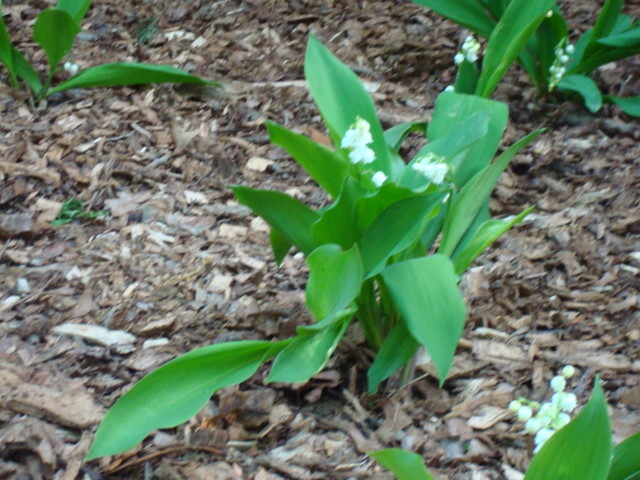 Two weekends ago Brad and I cleared a corner spot beside the house to plant some Lily-of-the-Valley. Already, their fragrant smell fills the air as I walk outside. Yes, it is the simple pleasures in life that can bring a smile to the face and happiness to the heart. and ~~~ while we were at Julie & Terry’s for Easter she has some of the 1010 Lillies of the Valley and Terry dug some up and now we have a few at Clifford Lake !! !